Fudge Kitchen started as Jim Garrahy’s Fudge Kitchen in Blackpool in 1983. In 1995, the company was bought by MD Sian Holt, who, over the course of 18 years, expanded the Fudge Kitchen retail side into eight thriving shops in Bath, York, Cambridge, Canterbury, Windsor, Edinburgh and Oxford; before steering the brand into a new, exciting wholesale phase of its life, with the development in 2012 of the Devilishly Different Gourmet Butter Fudge range. Still using the finest, natural ingredients, handmade and hand decorated by an artisan staff in their new dedicated production facility in Aylesham, Kent, but now with an extended shelf life of six months. All their fudge is made with completely natural ingredients, and most are vegetarian friendly and gluten free too. 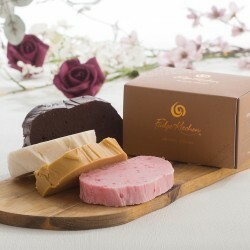 Their range includes innovative gourmet butter fudge products such as drinking fudge and liquid fudge sauce. Fudge Kitchen are proud to have received fifteen Great Taste Awards in 2010, 2011, 2013, 2015, 2016 and 2017 for their fudge. They have also been named Ambient Manufacturing Company of the Year at the 2014/15 industry Oscars, the Food Manufacturing Excellence Awards. MD Sian Holt was awarded a Special Award for Leadership and Vision by Produced in Kent and was listed in the Kent Business Power List of 40 most influential business leaders in Kent.